I get a ton of emails about washing soda. While it’s pretty easy to find in the stores here in the USA, a ton of my overseas readers (who I LOVE dearly) can’t seem to find it in stores. I’m not sure if it is called something else in other countries or if they just don’t sell it, but I wanted to make sure you could make your own if you can’t find it, so I set out to figure out just how it is made. You will not believe how easy it is. You only need one household item…that I’m pretty sure you probably already have. If you don’t, it’s super cheap…baking soda. What??? Baking soda! Some of you may even be wondering what washing soda is…it’s a powerful cleanser and water softener, washing soda has a long history of traditional use. It’s rich in sodium and can be made from the ashes of seaweed, kelp and other vegetation, though these days it’s usually derived from limestone. 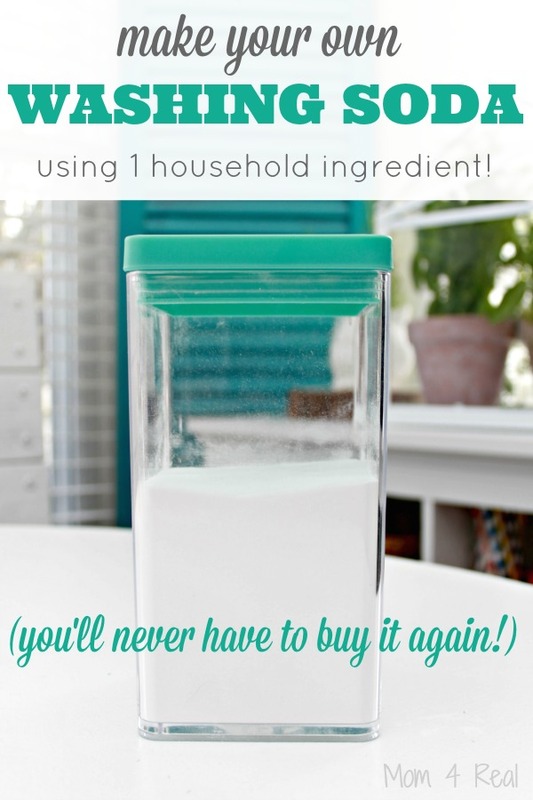 I have used it in my Homemade Laundry Detergent Powder and my Homemade Baby Safe Laundry Detergent For Sensitive Skin, Homemade Dishwashing Tabs, and Homemade Dishwashing Detergent, but it has tons of uses. It is a great laundry brightener too! To make your own, you will need baking soda, a pan with a lip around it ( I used a 13 X 9 baking dish) and a spatula. Preheat your oven to 450 Degrees Farenheit. Pour your baking soda into your baking dish. You can make as little or as much as you like at a time. I made enough to use for several loads of homemade laundry detergent. Place your baking dish in the oven and let it “bake” for an hour, stirring the baking soda a few times during bake time to make sure all of the baking soda is being broken down. Remove from oven and let cool. The baking soda should be a different consistency once it’s turned into washing soda…instead of being light and fluffy, it will look a little more dull and grainy. That’s it, friends! For pennies, you can make your own washing soda! I hope this helps those of you that can’t find it in stores, and saves those of you that are budget minded a few pennies too!